Because like he said in the making of piece, this isn’t a finished work of art they’re tampering with, it’s film shot to document real events that was only in black and white because they had no other option. It wasn’t a creative endeavour. I agree that it didn’t look totally real, despite all the work they put in. Colorization probably never will. I did think it looked better in 2D. Dudley Morris, longdist01 and Chris DeVoe like this. Yes - I think I mentioned that in my first post. It's the high quality of the restored B&W photography that most made me long for a B&W version of the movie. That footage was crystal clear and razor sharp, whereas the colorization made the same footage look smeared and fuzzy. A restored B&W version would've looked amazing! This is slippery slope territory, as for all intents and purposes, most B&W movies had no other option. Yes, I realize color movies go waaaay back, but obviously they were more expensive to shoot for a long time, so B&W was the only practical option. John B and Oatsdad like this. Yes but the other half of the argument is that this wasn't creative work, it was only meant to record what was going on. And it's not any more "natural" for there to be no colour than to have fake colour. I'm not saying I'd go back and colorize all black and white film, but with this project Jackson had a specific goal in mind -- this footage captured the brief existence of all these men before their lives were cruelly cut short. He wanted to try to put them on screen looking like real people and not extras in a silent movie. And real people are in colour. Given that, I think what they did was ethically acceptable in the universe of cinema. There was more to it than just "I don't like that it's in black and white." Really, though, I think getting the footage to the correct speed, as well as cleaning it up pre-colour, did most of the work. Like I said in my first post about this they did other things that worked against the realism... as with colorization, the world is in three dimensions but 3D doesn't really look like the 3D the world is in. Dudley Morris, beccabear67, andrewskyDE and 4 others like this. I saw this last night and the moment the film went from B&W to Color the small audience gasped. Hearing the men's reasons for joining the fight added to the sadness for me, some of them only 15 years old. longdist01 and SandAndGlass like this. I do get that news footage doesn't have the same artistic decisions involved like a feature film would. I know that a movie like "Maltese Falcon" would be specifically lit and composed for B&W, whereas war footage is just shot as is. I still think it's slippery slope territory, though. First it's news footage that's okay to colorize, then it's shorts, then it's "minor" feature films, and so on. Even if the color looked good, I'd not like it. Since I think it looks bad, it's an ever easier choice to make! Rep. Walter Jones of North Carolina died yesterday. A local radio station played an interview from last year where he said that a couple of years into the Iraq War, he visited a school near the military base Camp Lejeune as part of a program to encourage young readers. When he finished reading from a Dr. Seuss book, he asked the students - mostly children of military members - for questions and comments. The last student, a six-year-old boy, said "My dad isn't dead yet." Jones became one of Congress's most outspoken critics of the war. SandAndGlass, Chris DeVoe and longdist01 like this. Often, it was just a matter of money. For instance, I would have no problem with someone colorizing Jimmy Cagney's Yankee Doodle Dandy. It was only monochrome because the studio wouldn't pay for Technicolor. Hooray for the Black, White and Grey! Funny, I felt exactly the same about YDD. It is obviously a movie that should and had every right to be made in color, but, as you say, the (stupid) studio would not spring for the expense. How ridiculous is it that a movie like this was not made in color. longdist01 and Chris DeVoe like this. But the problem is that the film was lit and shot for B&W. Like I said, a whole lot of B&W movies would've color if it was cheaper. 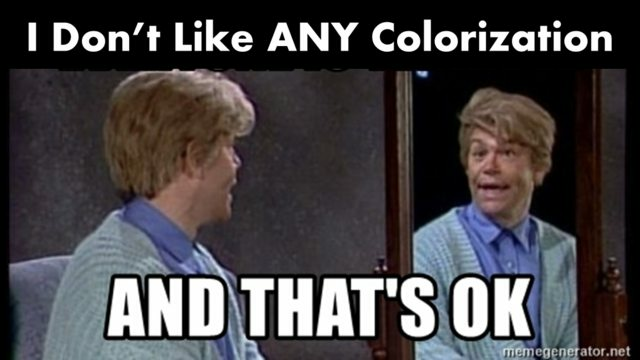 That doesn't mean they should be colorized - don't change art! Well, wouldn't it have been? As a B&W movie it was not remarkable as any great B&W work of art. It was just another B&W movie, nothing special. That doesn't mean they should be colorized - don't change art! I'm pretty much always in the don't change art category (which applies equally to George Lucas). But YDD, in B&W adds nothing to a movie that is obviously a very colorful movie. Casablanca, is an entirely different matter. It's irrelevant if you think it was a "work of art". You can always turn the color off. I grew up watching color movies on a B&W TV, so watching a movie that should have been made in color is no great stretch. longdist01, Lightworker and EddieMann like this. If there had been color and sound in the time period they would have shot footage with both so I have no problem with the ethics. Nobody was making a Raging Bull or To Kill A Mockingbird (or even Eraserhead). I do understand that something composed thoughtfully for monochrome down to the film stock quality and lighting and so forth should stay b&w. Unfortunately I saw some of the earliest attempts to color Laurel & Hardy and it was awful. New compositions, both stylistically of the period and modern, have been written for silent films that either never had something official composed, or any such music was lost, and in most cases the results have really been a huge benefit for the viewer! Sometimes these will include some sound effects blended into the composition as happened back then. Same for new inter-titles, though always inkeeping with the style of the time period as far as I have seen. '50s TV like I Love Lucy or Superman, or some of the lighter story weight musicals... feel free to color them, no objections here with those. Yes, but it is one of those "not very well done" colorizations. That was an early colorization attempt, that, I agree, wasn't too good because the technology to do it was early in the process. Now, if Peter Jackson, were to re-do it in the colorization that was available today, I think the results would be quite impressive. dewey02, longdist01 and Chris DeVoe like this. Anything that those brave lads did for us that keeps them in the public consciousness is alright by me. SandAndGlass, longdist01 and Oatsdad like this. I do appreciate that the film brings WWI back into the public consciousness. Here in the US, WWI had been badly neglected for decades. Really, ever since WWII, WWI seems to have been largely forgotten by the American public. I don't think "Old" will change that, but it's good that it brings the movie back to the table. I went to a screening with a 95% filled theatre in January, ages ranged from several families, groups of teens(12-17yros) and many seniors...when the format on screen changed from 4x3 to widescreen and color there where many oohs and ahhs and sadness as the remaining footage unfolded. I haven't experienced that much emotional devotion to a cinema viewing in probably 15-20 yrs...and this documentary is still opening on more screens. Maybe Titanic was the last release where i have seen as much curiosity to experience in cinema, though not on same box-office #s.
BeatleJWOL and SandAndGlass like this. Between the 100th anniversary of the end of the war (and thus the establishment of Armistice/Veterans/Remembrance Days), the "Old" movie, and the current debate on the relevance of mutual-defense agreements ("Does a strength-in-numbers posture help keep the peace via deterrence, or is it more likely to escalate a single shot into a war that kills 17 million people?") WWI is certainly enjoying a higher-than-average Q score at the moment.